Welcome to the first Zurich Instruments newsletter of 2015. This month we’re launching not only one, but two new products simultaneously - the MFLI 500 kHz and the MFLI 5 MHz lock-in amplifiers - which bring Zurich Instruments’ know-how and expertise to the medium and low frequency domain. Full details about these exciting new products are given below and we’re expecting that yesterday’s bland beige instruments are soon going to be replaced by the sparkling white and blue of Zurich Instruments. Our new YouTube channel is also up and running - here you’ll find an introduction to the MFLI as well as an overview of the UHFLI and LabOne. Let us know what you think and what new videos you’d like to see. Finally, there’s exciting news about our new Student Travel Grants and Scientific Workshop Sponsorships. Take a look and see if you’re eligible for Zurich Instruments’ support! After more than a decade of negligible innovation within the low and medium frequency lock-in amplifier market, Zurich Instruments is once again proving itself to be the technology leader by releasing two fully featured products that are poised to overshadow what has been available in the market until now. It is time to store away those old boxes and move to the new standard for measurements up to 5 MHz: the MFLI Lock-in Amplifier. Users will benefit from superior performance paired with the outstanding LabOne® toolset that Zurich Instruments customers know from our high-frequency instruments. Except for the frequency range the products are identical and provide exceptional performance, with a voltage input noise of <3 nV/√Hz down to 100 Hz, a dynamic reserve of up to 120 dB and a 200 kHz maximum demodulation bandwidth even when using 4th order lowpass filters. Digital processing architecture assures the highest performance, delivering a precision which is several orders of magnitude better than the analog specifications limits. One example of this is the 48 bit output resolution for demodulated signals. A Sweeper which scans almost any variable of the instrument with defined granularity, recording demodulator data and other quantities. As an example, when operated in Frequency Response Analyzer mode, the Sweeper provides recording of Bode plots. On top of that, LabOne offers further tools (e.g. Software Trigger, Plotter) and APIs (application programming interfaces) with functionality that help to make daily operations much more efficient, reducing setup complexity in order to achieve and share results more quickly. The MFLI is the first lock-in amplifier with an embedded web and data server that by starting a web browser on your computer allows control of the instrument and access to measurement data. No software installation is required for this purpose, making it probably the most straightforward measurement start a user has ever experienced with a computer controlled instrument. Zurich Instruments' unique LabOne runs inside the instrument and, using the USB or Ethernet connection, full portability to tablets and other handheld devices is provided thanks to the responsive user interface design. The MFLI targets highly demanding applications while operating in the low and medium frequency domain. Examples include optical experiments that are modulated by mechanical choppers or by the repetition rate of pulsed laser sources. With negligible noise power emitted from the inputs it is also very attractive for low temperature physics experiments, such as the investigation of certain transport phenomena measurements, or other experiments with mesoscopic systems. The base version comes with one dual-phase demodulator providing amplitude, phase, in phase component and quadrature component with respect to a single reference frequency or any higher harmonic. 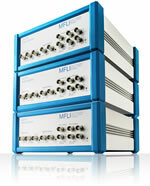 The MF-MD Multi-demodulator option upgrades the system to have 4 demodulators and 2 independent oscillators. With this option installed, the voltage and current input can be measured simultaneously hence allowing for 4-probe measurements. The second available option, the MF-F5M Frequency Extension option transforms the 500 kHz instrument into the 5 MHz lock-in amplifier. This all comes with a very attractive price tag: the MFLI 500 kHz Lock-in Amplifier starts at USD 5,980 in the Americas and EUR 4,600 in Europe. The 500 kHz model can be upgraded to become a 5 MHz instrument at any later point in time without hardware changes, i.e. without returning the instrument. For more technical details or quotations, do not hesitate to request information or read the Q & A. During the development of the MFLI we exchanged many ideas with experts in their fields, both in academia and industry. We are pleased to introduce two of them to you in this newsletter: Samuel Groner and Peter Märki. 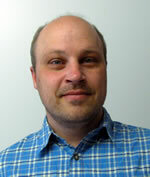 Samuel has an extensive background in audio circuit design and Peter develops circuits for low temperature experiments. 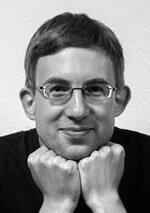 Samuel Groner, Audio electronics expert at Weiss Engineering Ltd.
How would you best describe your work? I work in three main areas all related to high-end audio instrumentation. At Weiss, I am part of the interface between marketing and design. The marketing defines the requirements and features for the next product. I then give them feedback on feasibility, producibility and cost. The second area is the implementation of the analog circuits. This mainly consists of conceptual work, simulation and prototyping. Third, I am doing research studies and writing publications. This is something that I started doing after I didn’t find enough satisfying information on certain aspect of circuit design. One of my main research today is the behavior of passive components with respect to distortion. What are the biggest challenges in analog design of high-end audio electronics? High-end audio amplifiers need to have an enormous dynamic range. For applications with small signals, low noise is the key specification. For applications with large signals, low distortion is most important. However, often the requirement is to combine the two into one instrument. Another challenge is in selling the high performance instrument. The customer usually chooses the audio product by listening to music and comparing their auditory cognition with this product to other products. This cognition is of course highly subjective and so this makes the brand, look and feel of the amplifier at least as important as the audio performance. Could you briefly describe your favorite audio circuit design? One of my favorite projects was a custom audio amplifier that replaced commercially available operational amplifiers in one of our instruments. The requirement was to achieve an extremely low distortion of 140dB. This spec is of course quite demanding, but in reality the main challenge resulted in fitting this highly complex design, consisting of 50 transistors, into a space of 30 x 45 x 20 mm3. Do you think that researchers in physics and engineering can learn something from the audio industry? And if so, where would they find this information? Whenever you need a low-noise low-distortion amplifier in the audio frequency region of up to 20 kHz, you can find very powerful audio circuits. As sources of information there are, besides the internet, the Audio Engineering Society (AES) and numerous books on audio technology. It is a very interesting job with a lot of variety, every day is different. Today I did some hands-on work, covering a noisy pulse tube cooler with acoustic isolation sheets. On some days I repair broken devices, build simple equipment or search for noise-sources on measurement setups. On other days I develop new electronic devices and try to outperform commercial equipment. Often the physicists come to me with various questions about electronics. 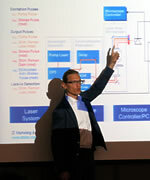 What is the main challenge in designing electronics for low-temperature physics? We work at the limit in each discipline. The noise level of samples in low-temperature physics is extremely low and every improvement in noise in external equipment has a direct impact on the measurement possibilities. When we can reduce the noise of our equipment, we are able to reach lower temperatures and therefore we can resolve finer details in physical effects or even new phenomena. Could you briefly describe your favorite electronics design? In one of my projects I developed a variable ultra-low noise voltage source. Our samples are cooled down to 0.01 K and therefore the surrounding thermal noise is low. If you then apply a voltage to the sample, the noise of the voltage source at room temperature is the dominant noise source and this noise can actually heat up the sample. My strategy was to use multiple commercial voltage references at constant temperature and build the average of their output voltage, thereby reducing their noise statistically. Together with a complex analog low pass filter, I could achieve a noise of 90 nVRMS over a frequency range of 0.1 Hz to 100 kHz at 10 V output voltage. To further reduce this noise at the sample, we use passive filters at low temperature, where resistors exhibit lower thermal noise. How would you describe the collaboration between you, as the electronics expert, and the researchers in your lab? Honestly, I don't understand in detail what the researchers do and they don't understand in detail what I do. Nevertheless, many people come to me and tell me about their measurement challenges; together we can usually figure out a good solution. The important thing is that the collaboration is based on partnership and therefore feels like a big family. Are you a PhD student who's had a paper published recently that mentions one of Zurich Instruments' lock-in amplifiers? 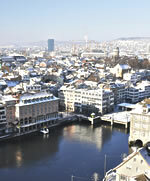 If so, you could be eligible for one of our new travel grants, worth 1500 Swiss Francs. We have three grants available, for travel to a conference attended by Zurich Instruments as an exhibitor. Winners will be acknowledged in our Q2/2015 newsletter. They''ll be expected to visit the Zurich Instruments booth at the appropriate event for promotional purposes and will be mentioned on our social media channels. Contact Adeline de Wilde for more information on how to apply. New for this year, Zurich Instruments is reaching out to research teams who are organizing local scientific workshops or events by offering a monetary contribution to help cover running costs. We will commit to attending the workshop and also welcome the participation of other commercial companies. Please contact Adeline de Wilde for more information and/or with details of your event. Differential signals offer numerous advantages over single-ended signals, such as immunity against ground noise and electromagnetic interference, which can lead to better signal-to-noise performance. However, generating a differential signal is not always straightforward. Most network analyzers and function generators only have one port for providing the output signal, so if a differential signal is required a more expensive network analyzer, or signal generator with two ports, is needed. Alternatively a transformer or splitter can be used but with these the user will have to cope with a limited frequency range. The high-frequency outputs of the new MFLI Lock-in Amplifier can be operated in either single-ended mode or differential mode. In the differential mode the two output terminals provide complementary signals, i.e., the same signal with opposite polarities. As an example, if the signal value of one output at a certain point in time is +1 V (referred to ground), the other output would be -1 V. The differential voltage in this case is 2 V.
A differential output can be used in a number of applications. An example is differential capacitance measurement, where the resolution is increased by employing a reference capacitor. In this case, one output signal is applied to a capacitance under test and the inverted signal is applied to a reference capacitor. Both capacitors can be connected to the current input of the MFLI to measure the current difference and thereby the capacitance change (Detecting a small fraction of impedance changes with improved sensitivity). The differential output is also useful for thermal conductivity measurement, where the heating resistor can be connected in a differential way. This reduces the ground currents and crosstalk to the sensing part. Another example is the excitation of a Wheatstone bridge. Instead of connecting the excitation ports between the drive signal and ground, the ports can be connected in a differential way to the positive and negative drive signals. This eliminates the common-mode signal at the output of the Wheatstone bridge and also reduces the ground currents. Generally, with the MFLI providing both a differential input and a differential output, it is straightforward to perform various tests on general purpose electronics, filters and sensors.